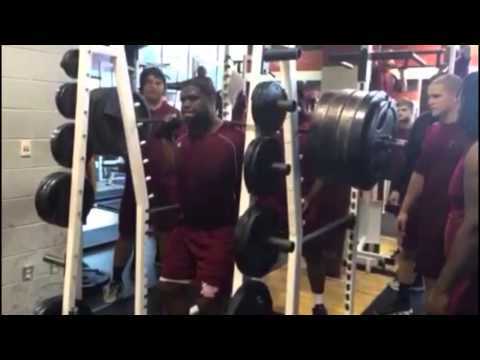 Heavy Squat - You Think You Squat Heavy? 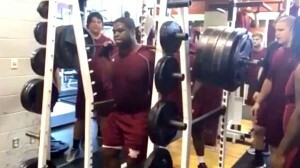 Watch This Heavy Squat! To heavy squat or not? I wonder if the following is motivating or demoralizing to you? For me, even though I am celebrating 5 sets of 5 reps of squats with 120lbs, approximately 10x lighter than what Terrence is going to squat in this video, 810 pounds, I find it motivating. Just to see him squat that much weight gives me some encouragement that going up to 90lbs and then maybe one day 135lbs or even 200lbs is within the realm of possibility. What do you think? So, you think you're pretty strong? Well, get a glimpse of this. A video recently surfaced on YouTube picturing Terrence Jones at a squat rack. If you aren't familiar with Jones, he's a mammoth man — 6-foot-3, 320 pounds — and plays offensive line for Troy. Jones, who was an All-Sun Belt selection at tackle in 2013, has freakish leg strength and showed it off by squatting 810 (!) pounds. What's amazing is Jones didn't even struggle with the weight — he definitely left pounds off the rack, which makes us wonder how much more could he do? Don't even think of trying a heavy squat like this.